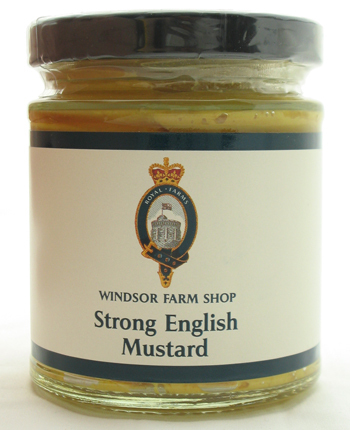 English Mustard is quite hot. It comes either as a powder in a tin, or as a prepared mustard in a jar. If a recipe just says “English Mustard” or “mustard powder”, it’s the powder that is meant. The powder is mostly used in the kitchen, the prepared is used at the table. The prepared is bright yellow from the turmeric in it. 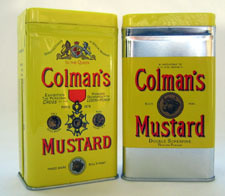 The most famous brand, Colman’s, is sold only as a powder in North America, but in the UK you can also buy Colman’s as a prepared mustard in a jar. Colman’s make many other products such as mint sauce, bread sauce mix, curry powder, horseradish sauce, Dijon mustard, American class mustard, honey mustard — they used to make even self-rising flour. There are other brands of mustard powder; Colman’s is a brand name. Colman’s is made from brown and white mustard seeds. Originally, black seed was used in place of the brown seed. The two types of seed are ground separately, then sieved, then mixed together. There are two types of Colman’s mustard powder, the Double Superfine and the Genuine Double Superfine. Both have wheat flour added. Mustard powder also acts as an emulsifier in sauces. You simply add cold water to the mustard powder and mix up as you need it. Mix to a thick paste. Let stand between 10 and 30 minutes for the flavour to develop. Make only as much as you plan to use up in a few hours, because after that the flavour starts to weaken. Cider or beer can be used in place of the water. For the prepared mustard, try substituting a Chinese-style mustard, but reduce the quantities. For the powder, you can grind up mustard seeds yourself. Prior to 1720, English Mustard powder was ground up coarse, to make a mustard as coarse as Meaux mustard still is today. In 1720, though, a woman named Mrs Clement, who lived in Durham, starting grinding her mustard seed very smoothly: she put her ground seed through a mill, then sieved them to remove the hulls. The smoother style mustard that she produced caught on. Keens & Sons Company was founded in 1747 and began making mustard powder. Jeremiah Colman was a miller who in 1814 bought a flour and mustard mill in a village called Stoke Holy Cross on the River Tas just 4 miles (6.5 km) south of Norwich, Norfolk, England. He bought out the business from a Mr Edward Ames, and brought his nephew James into the business as a partner. The mill was called Stoke Mill; it is now (2004) a restaurant with Colman items on display. In 1836, he set up a branch in London on Cannon Street. By 1851, he had about 100 employees. Jeremiah died in 1851, and James died in 1854. James’s son, named “Jeremiah James”, took over at the age of 21. In 1855, the Bull’s Head logo began appearing on the tins. In 1856, he moved into larger premises right inside Norwich, and had about 200 employees. Jeremiah Colman was appointed mustard provider to the Queen (Victoria) in 1866. The medals on the tins are medals that were awarded to J&J Colman company for their starch and mustard products in 1878 at the Paris Universal Exhibition. Outside of the UK, in places such as Canada, New Zealand and Australia, Colman’s still sells its dry mustard under the Keen’s name. In New Zealand, a zealous person is describe as being “keen as mustard”, in a double-play on words. Colman’s used to sell ground nutmeg under the Keen’s name as well. 2010 study done by Consensus Action on Salt and Health (CASH). As quoted in: Jamieson, Alastair. Salty Sunday roast dinners are putting Britons at risk of premature death. London: Daily Telegraph. 5 December 2010. French, Michael and Jim Phillips. Cheated Not Poisoned? : Food Regulation in the United Kingdom, 1875-1938. Manchester: Manchester University Press, 2000. Page 27.